We’re all familiar with the phrase “work smarter, not harder.” Unless you’re performing grueling physical labor, that’s a phrase that college students can really embrace — especially when you consider that you’re using your brain over any other part of your body. As it probably stands, even at this relatively early point in the spring semester, you’re likely already feeling swamped about your time and workload. College Can Be Difficult. But We’re Here To Help! You may as well put a few handy lifehacks into practice, right? At Kent’s Best Apartments, our goal is to make KSU students’ lives just that much easier by hooking them up with a living situation that’s close to campus, well-equipped, and stress-free. We’re not the ones studying and subjecting ourselves to academic hardships, so really, it’s the least that we can do for the student community! 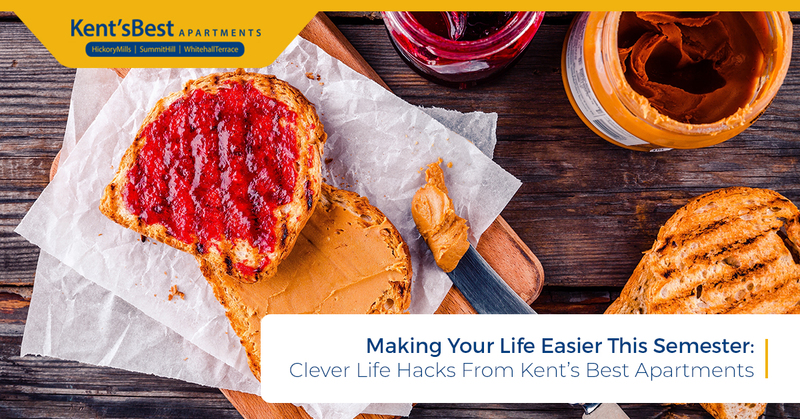 To help you save time and conserve precious brain power this year, read below for some truly clever life hacks courtesy of our pet-friendly student apartments in Kent. Place a gummy bear or another delicious, snackable item on each paragraph or page of your textbook. That way, you’re incentivized to keep reading with a clear goal (and reward) in sight. Tired of plastic grocery bags collapsing into your waste bin whenever you throw something away? It’s a small problem, but frustrating nonetheless. A simple picture hook stuck on to the side of your trash bin will easily hold the plastic bag in place! Simple, but effective. That’s the true nature of a life hack. Buying certain quantities of pizza toppings can get rather costly if you’re making a homemade pizza. More often than not, you’ll end up wasting the extra toppings that don’t end up making it onto the pie(s) that you make. Hit up a salad bar at a nearby grocery store — heck, or even on campus — and throw some toppings in a to-go container. Salad bars almost always have items like olives, onions, bell peppers, mushrooms, etc., and it should only cost you a few dollars for these toppings. Dinner is served! Need A Giant Ziplock Bag To Store Something? Create a makeshift waterproof carrying bag or store an absurd amount of your homemade leftover pizza(s) by connecting two ziplock bags. To do this, simply flip one inside out, and it’ll zip/connect into the other Ziplock bag. Boom! Now you have a giant bag ready to go. Everyone loves ice cream, but this creamy and sweet experience is better when it hasn’t melted and subsequently been re-frozen. The next time you’re at the grocery store buying a container of Ben & Jerrys, give it a quick and simple check: press on the top of the container. If it feels solid, then you’re good and the ice cream hasn’t melted at any point. If you press down and the container slightly depresses, that means that the ice cream thawed at one point, and then re-froze. No Smartphone Stand? No Problem! If you have any extra pizza toppers on hand (these little guys prevent the top of the pizza box from sticking onto the surface of the pizza itself), simply cut a leg off (any leg), wash off any remaining grease, and voila! Now your smartphone will be propped up for an optimal viewing experience. Don’t put your hung clothing into a cardboard box. Simply place an oversized garbage bag with a cinch over them, and they’ll be ready to move when you’re ready. Just make sure that you don’t grab a used bag, for obvious reasons. Look, you’re a college student. A loaf of bread is cheap, as is peanut butter. Various spreads can be pretty inexpensive, too. Sandwiches are rather filling and easy to take on-the-go, but you’ll get bored of the same bite after bite of peanut butter and jelly. It’s time to shake up your experience. Take one piece of bread, and slather on three different spreads (jellies, nut butters, etc.). Do the same with the other piece of bread, but in a different direction so that one piece of bread is horizontally spread and the other is vertically spread. Now, you’ll have a total of nine different flavor combinations, so every other bite will taste different! Freezing Ground Meat For Later Use? Ground meat is pretty cheap and makes for a tasty meal, and buying in bulk only makes it more cost-effective. Since you’ll obviously need to freeze what you’re not going to cook, try to flatten out the meat in a Ziplock bag so that it cuts down on thawing time. Easy! For clothes: use hand sanitizer. Sharpie may be strong, but it’s not completely irreversible. That’s All For Now. Stay Tuned For More! From our pet-friendly student apartments in Kent to our readers, we wish you a great semester with many wins and success. As always, don’t hesitate to get in touch with Kent’s Best Apartments if you have any questions. Stay Tuned On Our Facebook Page Here!